As you have all seen on here that I opened up the Invitation Only event to all of my readers, tweeters, and dearest fashionista’s, Today myself and the team were up and ready to go. The theme of today’s events have been all about that wonderful customer service, luxury garments to accessories, finally with hidden bit of pampering. Inside the Becca Boutique on the lower ground floor whilst keeping out the wet weather the weather man predictor, which is meant to worse tomorrow. We have been entertaining our guests with a very luxury afternoon tea which is a delight featuring maroons, cakes, and the famous English cup of tea. Statements of accessories came from Crow which are perfect to finish off any outfit. These luxury accessories featured leather clutches, medium satchel bag, and finally large totes. Upstairs make up and pampering galore! Cosmetics covered shelves across shelves; it was like being in Aladdin’s cave of wonders... The only wonder was which products to go for because, they were so many of them which a girl needs (or may want). 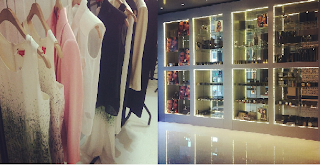 Luxury was a feature within today’s event at Becca featuring silk floral garments, which hung beautiful on the hangers…Lush’s should there spring/summer 2012 pieces which sprung out pastels and warobe staples every women needs. Pop down to the store now whilst, your out and about... To enjoy a stylish pamper of an event... What a perfect way to spend the weekend?? 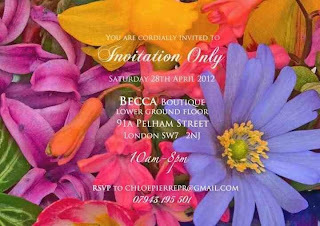 * Invitation from my blog and other images frombSocial Media & Fashion PR Executive dearest Chloe Pierre since my images I took on my camera came out blur. ( That another job before monday,to get camera fixed).